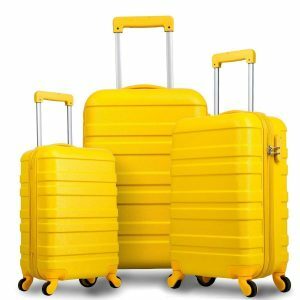 WELOVE LGX-H018 Luggage Set is made up of three pieces of beautiful looking lightweight spinner and expandable hardshell suitcases that are made of solid ABS plastic and polycarbonate of 20, 24 and 28 inches. It can be used for both casual holidays or formal business trips, also depending on the color you choose. Yellow looks quite nice but you may want to check out the olive yellow, black, purple or royal blue if yellow is too bright for you. Whichever combination you choose- only 24” medium size, 20” and 28” or the set of 20”, 24” and 28”, and whichever colors, they all have the glossy exteriors. 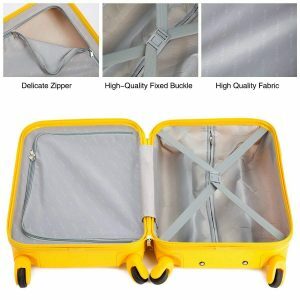 These are very good quality suitcases that score 5 out of 5 stars by six customers that purchased the product. The suitcases in the WeLove Luggage Set has some user friendly features like the solid side and top handles, telescoping handle, the wear pads, anti-collision wrap angle, TSA password locks, rotating spinner wheels, spacious interiors and sturdy hardshell exteriors. The ABS plastic and PC hard shell exterior is both robust and lightweight, letting you pack in more without needing to go over the weight limit. It is easy to change the password with the simple instructions on the product page. The four double multi-directional spinner wheels rotate and move in all directions, 360 degrees. There is ample space in these suitcases and by unzipping the middle zipper you can expand its capacity by 15%. With the firm coded lock the security of the contents of your luggage is guaranteed. The exteriors of these suitcases are resistant to dirt with scratch-resistant finishes and are easy to clean with just a damp cloth. It has a full lined interior with a high quality fabric- 210D polyester material with a divider and high-quality fixed buckle. The 20” cabin bag measures 20 x 13 x 10 inches without the wheels or handles, the medium 24” suitcase is 23 x 16 x 10 inches and the large 28” case if 28 x 18.3 x 12 inches. They are all easily manoeuvrable by holding the ergonomic push-button aluminum alloy trolley handle and give you a good range of motion even in tighter spaces. The double spinner wheels glide effortlessly in all directions. If you choose one of the non-black colors you’ll get a lot of attention at the terminal. And you’ll be easily able to differentiate your luggage from the rest on a carousel. The sturdy ABS + PC material is very durable with the tough corner guards. You can keep your smaller stuff or important documents, phone charges and accessories in the separate zipped pockets. This is a strong luggage set with a solid hard shell exterior that you can have a peace of mind with, as your stored items will not be damaged in tough travel conditions. You can also buy these suitcases with confidence as they come with a hundred percent risk-free satisfaction guarantee as the company trusts its product for quality and durability. Great value for money overall.